We all have beliefs, opinions and goals that we want to achieve, lots of different thoughts going through our minds. These thoughts are created by imprints. An imprint is orignated through hearing, seeing and feeling. It can be good or bad, negative or positive. Our conscious mind is aware of what we hear, see and feel and then it’s automatically stored in the subconscious mind. Over time, if we hear, see or feel the imprint on a regular basis it turns into a core belief. We can reach these core beliefs through hypnosis and work on removing the negative ones by replacing them with positive suggestions, visualizations and affirmations. This can take time to do. 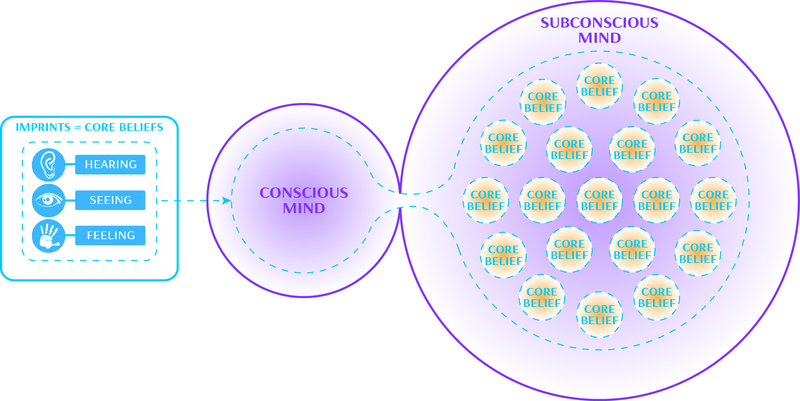 These core beliefs were formed through repetition, and through repetition and reinforcement under hypnosis, we can push out the negative beliefs, the ones holding you back. It can work more quickly for some people than others. It can depend on how long you’ve thought a certain way. You may have thought this way for decades, since you were a child, certain thoughts were ingrained into your mind, and when this happens it can take time to undo the damage. But it can be done. You also have to want to change, you want to be the best you can be, without your core beliefs holding you back.